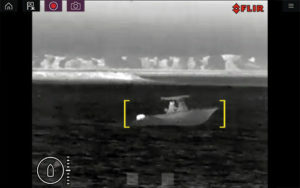 Fast forward to 2017 and we find that the combination of Raymarine’s latest Axiom multi-function displays, RealVision 3-D sonar, and FLIR Systems new pan-and-tilt marine thermal cameras delivers unprecedented levels of visibility and obstacle awareness in even the most compromised situations: during a dense fog, rain or at night. “Whether above water or below, Raymarine and FLIR are delivering marine detection experiences which really are the next best thing to being there,” according to Marine Special Products Group owner DG Fitton. “The detection and image quality are amazing – only surpassed by the drop in price points which makes this technology available to many more boaters,” Fitton added. The centerpiece of the experience is provided by the Raymarine Axiom family of Multi-Function Displays which feature lifelike imagery that, in combination with Raymarine’s exclusive RealVision™ 3D sonar, deliver superior underwater fish and structure identification from one transducer, no black box required. The rugged, all-glass touch screens are available in 7-, 9-, and 12-inch display sizes and come pre-installed with Raymarine’s new LightHouse 3 operating system which provides an intuitive navigation experience that is easy to personalize. 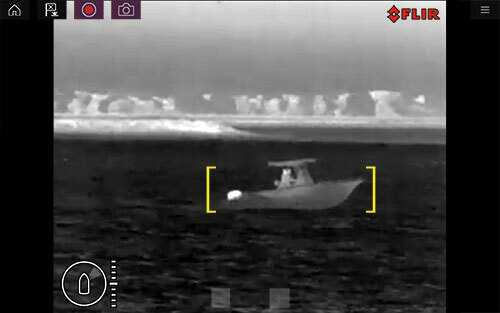 When the new cameras, the FLIR M100 and M200 – the most compact pan-and-tilt marine thermal cameras produced to date, are added to the experience, users will be alerted to any “non-water” objects such as boats, obstacles, or navigation markers that are identified. What’s more, the video processing capabilities of these cameras deliver superior image quality and artificial intelligence features which provide descriptive signatures very helpful in hazard identification. In short, you are able to see more on the water, day or night, which makes boating safer and more enjoyable. If you haven’t been thinking of upgrading to thermal image cameras due to cost concerns, now may be the time to rethink this. The pricing now makes this very useful technology more accessible than ever. Contact us to learn more.